The first official fast cycle route in the southern province of Limburg was opened last June when several officials from the province and the two municipalities that the route runs through cycled the entire length of the route with dozens of schoolchildren. Schoolchildren cycling on the Greenport Bikeway. The route was named “Greenport Bikeway” and runs from the railway station of Venlo to that of Horst-Sevenum, through an area with a lot of logistics companies and a horticulture industry for fresh produce and also dairy products and flowers. The Dutch national government designated the area a “Greenport”. There are actually two routes, I focus on the south part that runs parallel to the railway line from Eindhoven to Venlo and further to Germany. The routes of the Greenport Bikeway. In this post I focus on the most direct route parallel to the railway. The dotted red line indicates a temporary detour. The route runs partly on existing (upgraded) cycle infrastructure and partly on completely new infrastructure that was constructed on land that was acquired for the sole purpose to build this route. The new route makes it possible to cycle through the area without delays from other traffic or detours. The route has priority as much as possible and as few obstacles as possible. It consists of a wide path with a surface of smooth red asphalt. 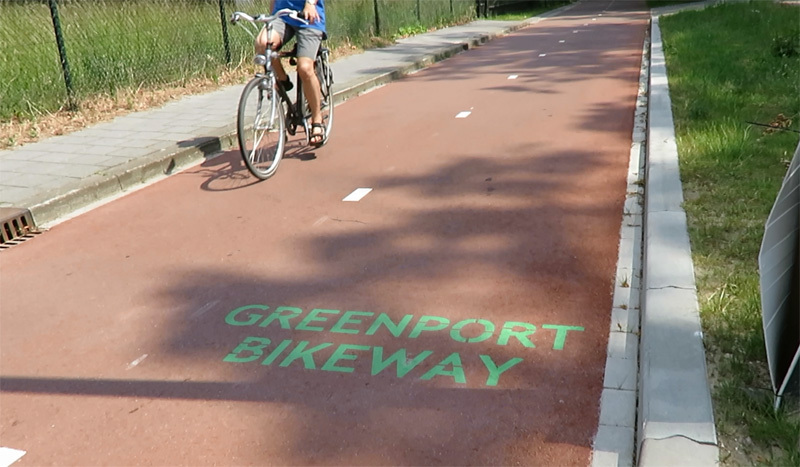 The name “Greenport Bikeway” is stencilled on the surface where you need to know which turns to take to follow the route. It would be nice if these stencilled names would be replaced by real signs in future. At both beginning and end and here at the halfway point there are some signs telling you how far it is to the end destination in both distance and time. At some other locations where the route takes some turns more signs would be helpful. (Video showing background information about the route). The main purpose of this bikeway is to get a high number of the 15,000 people who will soon be employed in this area to cycle to their work. This is not only good for their personal health, (for which reason the route is also referred to as “Healthy Highway”) it will also decrease congestion on the road network and that in turn is better for the environment. Other groups that can and will use the route are schoolchildren cycling from and to school and people who like to cycle for recreation. The route is financed by the national government, the municipalities Venlo and Horst aan de Maas and the Development Company Greenport Venlo. The stencilled name helps you find your way, but it is questionable how long this paint will last. Building started festively on 13 March 2014. It took only 15 months to build the entire cycle route. The opening took place on 4 June 2015. Building this route also meant that 500 new trees were planted. These trees are especially good for a certain type of wildlife: they help bats to navigate. To disturb the bats as little as possible the street lights have been constructed “bat friendly”. Unfortunately no information was offered as to what that means exactly, only that the lights are placed on masts made of sustainable wood. There was more sustainable development connected to the new cycle route. On two locations so-called “Plukbossen” (Fruit picking woods) were planted. These woods offer free fruit to passers-by who are allowed to pick as much fruit as they like. Fruit that falls off the trees also serves as food for the wildlife in the area, the badger and small mammals living here. Near the station of Horst-Sevenum at Grubbenvorsterweg there is a short detour of 300 metres. This has to do with the fact that the land directly next to the railway line could not yet be acquired. This temporary detour is a bit narrower and has black asphalt to clearly indicate that this is a temporary solution. It is not known how long this detour will have to exist. The so-called Greenport Venlo is one of six “Greenports” in the Netherlands. It is the second largest horticulture area of the country. Its location (so close to the German border where a lot of the products go) makes it a logistics hotspot. Horticulture in The Netherlands is regulated. The national government designated specific areas for it where improvements and development are stimulated. In the Greenport Venlo a number of public and private partners cooperate: local governments, researchers, educational institutions and entrepreneurs. Together they try to improve the horticulture with innovations and smart logistics. Goal is to double the economic value of the region from 1 billion to 2 billion Euro. For its 15,000 highly educated workers the Greenport Bikeway can be the route from their homes to their workplace. The real-time version of the entire ride. A 38 minute video! 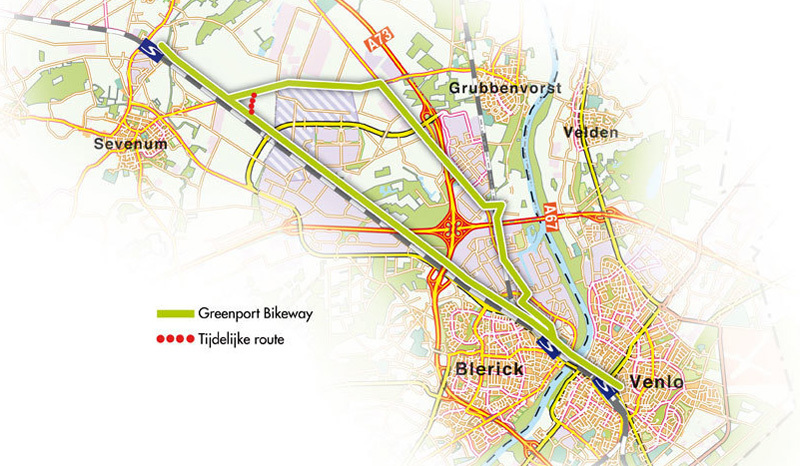 More information on the website of the Greenport Bikeway (in Dutch only). Thanks a lot for this video. I know the German side of that area quite well: I was born there. It is very interesting to compare the cycling infrastructure in the small Germany towns like Nettetal, Brüggen, Viersen, Kempen and so on with their Dutch neighbors. German and Dutch infrastructure differs in crucial points: The German route is a combined path for pedestrians and cyclists. On sunny Sundays it is impossible to actually ride here because there are so many people walking. Where regular streets cross, the cycle path is interrupted and blocked by bollards. Cars have priority. The bollards are hard to navigate – that seems to be intentional for “safety” reasons. Great to see 60 year old cycling infrastructure meeting 21st Century needs! The underpass before the railway bridge and the railway bridge bike path has been there since the late 50s. The person stopping at the Venlo end of the railway bridge could not have picked a worse spot had they tried. That was a pinch point on the way to and from school then and it still remains one despite realigning path towards the Roermondsepoort gyratory. The temporary path created from the hard shoulder of the Eindhovenseweg by a line of concrete kerbs will be “fixed” as part of a wider redevelopment of Blerick railway station. Most of the cycle highway has been stitched together and upgraded from preexisting trails and roads – I cycled them as a kid. A great way to make quick gains for cycling. Finally, 37 minutes is a decent time for the journey! How designers decide when to put curb at the edge of asphalt, and when not? To NOT put the curb is cheaper, but what are the consequences? What an inspiration! We in Santa Monica, California, look with envy at the stand-alone, completely for bicyclists, infrastructure created in the Netherlands, and we are only now getting started with our own small pieces of protected bike lanes, separated from auto traffic. Could you please write about these solar panel bike paths? Here in Santa Monica, California, we are very intrigued by that. That’s funny. I discussed those with some people here in the Netherlands, and everybody thought it was the most stupid idea ever. There’s no lack of space to put solar panels, so it makes a lot more sense to put them at an optimal incline above the ground (e,g. on a roof), instead of flat on the ground where they catch less sunlight and a lot of dirt. And from a bike path perspective, concrete or asphalt is always preferred as a surface. So these would only make sense if you’re running out of space on roofs. Until that moment, it might be a valid scientific experiment, but aside from that it’s a waste of money. At the 30 second mark in the first video, it looks like the kerbs are at a 90 degree angle. Why is this being done with new construction? There are no rules regarding the angle of kerbs. So every municipality uses the ones they think are okay for a certain place. It could be a cost issue but your guess is as good as mine. Assume they were 90 degree curbs. If you were checking over your shoulder or distracted or whatever and you hit the 90 degree curb, then you will be flying over your handlebars, not good. If they are 30 degree curbs, then you just bounce back. Is this going to be named the F-73, as it roughly parallels the A-73 motorway? Also, are you going to add an accelerated video? One last question. 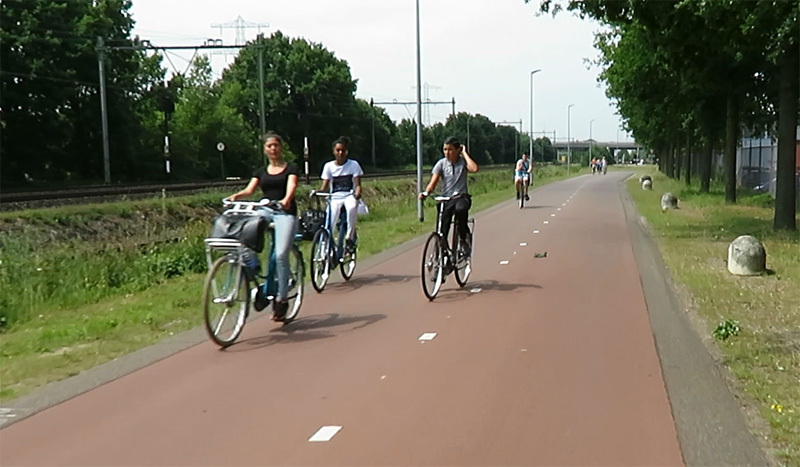 I know you will not wear a helmet unless you are going mountain biking or are planning a Tour de France ride on a race bike, but how about strapping a camera to your head, allowing you to ride at the speed most Dutch are capable of if they can ride with two hands. To prove the Dutch are not slow. I don’t think they will name it F73 now that they named it the Greenport Bikeway. The high speed version is already there and in this post. I ride the same speed with one hand or with two. I even pass people when I ride with one hand, so no need to do things different with the camera. That said. I did mount it on my handle bars for the entire ride this time. Too long to hold the camera for almost 40 minutes. Another option with that handlebar mount, how about using a spring to remove the shakiness so you can use it all the time. Wait a minute, are you allowed to put a mount on an OV-Fiets bike? 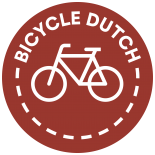 This entry was posted on 21 July 2015 by Bicycle Dutch in Original posts and tagged cycle superhighways, Horst, long distance cycle paths, railwaystations, ride, Sevenum, Venlo.